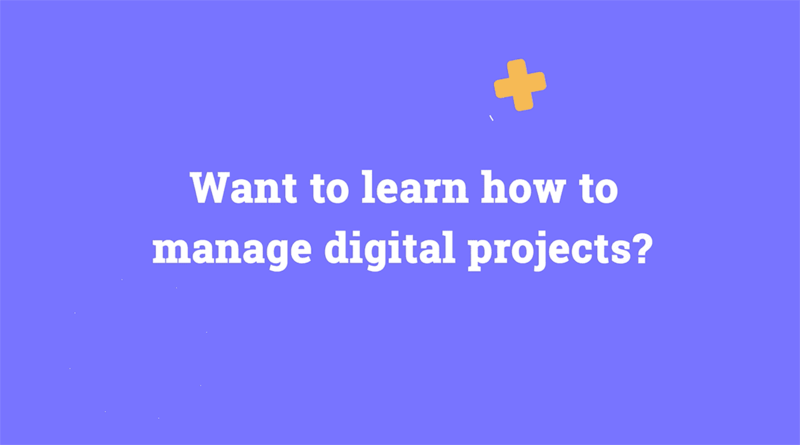 As digital project managers, one of our most crucial skills is the ability to communicate effectively with all of our stakeholders, both internal (developers, managers) and external (clients). But for a lot of DPMs, communicating with our developer colleagues can be a challenge. When you don’t have any technical knowledge of development, it can be difficult to “translate” client or even your own feedback into useful instructions for developers. Gaining some technical expertise as a digital project manager can vastly improve this communication. Learning technical concepts and terminologies allows you and your developers to speak the same language, so you’re able to waste less time talking past each other and have more time for getting things done. In this article, we’ll talk about how to identify what technical skills will be most useful for you and how to learn those skills. First, a quick note on what we mean by “technical skills” in this context. As DPMs, we use a mix of hard and soft skills every day. Hard skills are knowledge that can be taught and easily evaluated, like our ability to use a project management system or create a project plan. Our soft skills are what most people think about when they think about project managers: communication, critical thinking, leadership, and more. 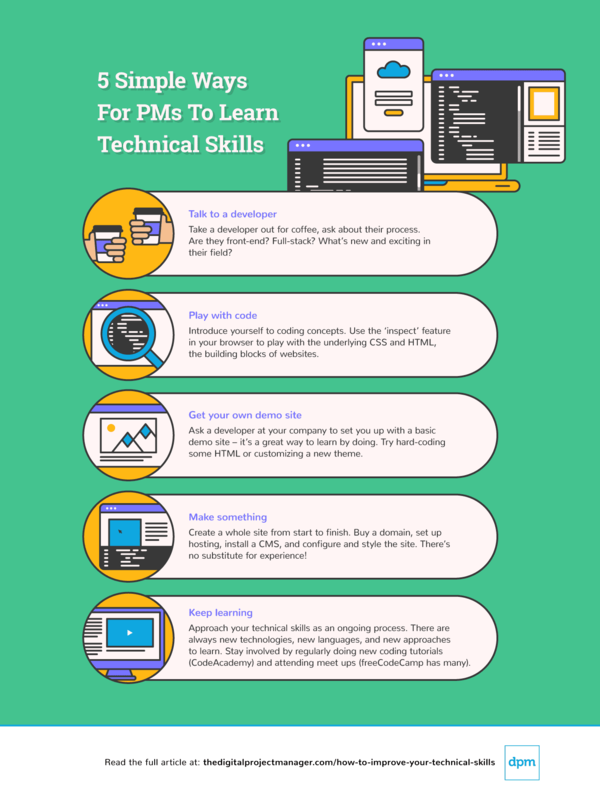 Here, we’re defining technical skills for DPMs as types of hard skills that allow you to use and understand code in the context of web development. Technical Skills In Project Management: Do They Really Matter? Most DPMs that I know are often overwhelmed just keeping their projects afloat day-to-day, making sure that you’re following PM best practices for running on time and on budget. 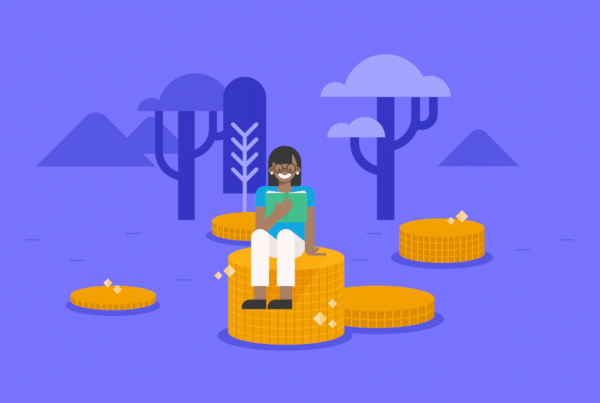 So why should you invest the time in building your technical skills as a project manager? Isn’t coding the developers’ job? Well, yes and no. Learning technical skills as a project manager doesn’t necessarily mean learning how to code. It’s more about understanding and familiarizing yourself with the work that developers do so that you can do your own job as a project manager better. Pretty useful stuff, right? If you’re ready to get started, your next step is to figure out what technical skills will be most beneficial for you. If you’ve ever looked at one of those “learn how to code” websites (and let’s be real, you have), you were probably overwhelmed by the sheer volume of languages and lessons that they offer. Web development is constantly changing and full-time developers invest a lot of time staying current in their technical skills. Where to even start? Where do you struggle in communicating with your developers? Are there particular parts of every build where you find yourself having to explain things over and over? Do you see recurring issues as part of your QA? What technical concepts do you have difficulty explaining to clients? The answers to these questions will help you determine where you could improve your project management technical skills. If you’re not sure what the relevant skills are based upon your answers, talk them through with a developer (see below) to see what they recommend. This is the kind of feedback that drives developers crazy. You’re basically giving them one of those old “spot the difference” puzzles. They have to visually compare the mockup against the page, and they may not easily be able to find what you’re looking for them to change. See how much clearer that is? The developer will know exactly where to look and what to change when they look into the code. Once you’ve identified what technical skills you’d like to improve, follow these five steps to move forward and get started. As DPMs, we can sometimes be intimidated by developers. It can feel like they speak a completely different language. But most developers are actually really excited to share what they do with their project manager colleagues and help DPMs better understand their work. What’s new and exciting in their field? Are they front-end, back-end, or full-stack? What do they find most challenging and most exciting about their job? How do they like to be managed? In an agency, developers are usually managed by different DPMs on different projects, and everyone does things differently. Are there things that other DPMs have done for them that they found really helpful, like including certain information in assigned tasks? A lot of learning about code is understanding cause and effect—if I do X, Y will happen. I’ve included a few links to resources for learning to code at the end of the article, but if you’ve never really looked at code before, the best way to start understanding these concepts is to play with underlying code using the Inspect feature in your browser of choice. HTML and CSS are the building blocks of all websites. If you think of a website as a house, HTML is the wood, concrete, and brick that builds the structure, and CSS is the paint, window treatments, and other touches that make things pretty. In the Inspect panel, try right-clicking and deleting or changing something. It’s likely that something on the page will be removed or change. See if you can make the connection between what you deleted/edited and what happened on the site. Your company probably uses some kind of demo sites while new work is in the build and test phases. See if your developer buddy can make you your own demo site with whatever basic install they usually use. Then play around your demo site. Try basic things like hard-coding some HTML in a page and adding some CSS. If you’re using WordPress, try installing and customizing a new theme. Look at a site that one of your developers built and try to replicate something. If you’re anything like me, you learn best by doing, and a demo site gives you your own place to learn and make mistakes. There’s really no substitute for trying to do the whole thing from start to finish so you can understand the workflow and where things can go wrong. If you get hung up, do your own research to try to fix the issue yourself before asking a developer to step in and help you. Figuring out a development problem on your own, even if it takes hours, is one of the best feelings in the world. Improving your technical skills is an ongoing endeavor. There are always new technologies, new languages, and new approaches to learn that can help you develop and hone your technical skills in management. If you see something on a site that you’re not familiar with, or you hear about something new from a developer, go back to your demo site and play around with it and find a way to learn more. CodeAcademy: a free site (with a paid subscription option) with self-guided, hands-on tutorials in a variety of languages and subjects. Each screen gives you a real-time code editor to let you test your knowledge of concepts. freeCodeCamp: Another free service that gives you specific, real-life tasks with a code editor to help you learn by doing, with a focus on front-end development. Many cities have local freeCodeCamp meetups where you can review each other’s work and discuss coding. Coursera: If you prefer more of a classroom-style experience, Coursera offers lecture-style courses led by professionals from around the world. Classes are often self-guided but have recommended timelines for study hours and completion. WordPress Codex: The codex is the WordPress “bible.” You may not understand much of it at first, but it’s a great reference for learning how things in WordPress are structured and fit together. HTML & CSS: The building blocks of all websites; will help you understand the underlying structure and what is easy or difficult to do to the overall layout of a page. Hosting: Understanding the different types of hosting that are available for websites as well what kinds of issues on a site can be caused by problems with the host is helpful. WordPress multisite: If you work with WordPress, you’ve likely come across sites using WordPress’ multisite feature, which allows multiple sites to be managed within the same WordPress instance. Understanding how these are set up and maintained is a good technical skill if you work with multisites. If you’re a DPM with strong technical skills, how have they helped you in your work? Or if you’re looking to build your technical skills, what are you looking to improve? Join the conversation in the comments below! Bethany Lang is a Project Manager at 10up. She began her career as a grant writer and fundraiser for nonprofits before transitioning into tech as a project manager and trainer for at both NeonCRM and Cornershop Creative, working with nonprofit organizations. She’s also worked as a WordPress and front-end developer alongside her role as a PM. As someone who has done a lot of web design and works as a project manager right now, you don’t have to be quite as specific as the example. If you know the difference between a pixel and a point then you likely are a web developer or a graphic designer at least. It’s perfectly OK to say that the size of the hero image doesn’t match that of the image in the mock-up or that the spacing is off. It’s the specific direction that you have to master, not necessarily the technical jargon. That’s what subject matter experts are for. It doesn’t hurt, but not as necessary as the article suggests. I do wholly agree that we as PMs should continue to skill up, but we also already have our hands full with all the processes, inputs and outputs.